Mitutoyo has added a new high-end model, Miscan Vision, to its portfolio of multi-sensor CNC vision systems. The Miscan Vision System is available in Apex and Hyper versions and combine very precise non-tactile measurement with high measurement throughput with highly accurate tactile scanning measurement. In recent years, the need for intricate parts measurements has been increasing rapidly, including the sensing technology essential in electric vehicles and autonomous driving technology. 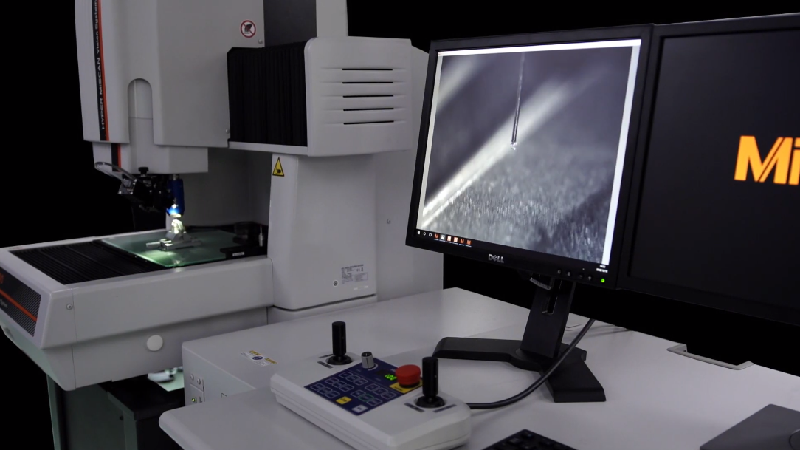 Responding to the need for high-accuracy and highly-efficient contour measurement, targeting intricate machined parts, the newly released MiSCAN Vision System is equipped with a simultaneously developed small diameter scanning probe – MPP-NANO. The APEX version uses the Renishaw SP25M scanning sensor, while the HYPER version comes with the new, high-precision Mitutoyo MPP NANO scan head, which can measure even the most intricate details and features. The MPP-NANO contact scanning probe offers tip diameters of 125 µm, 300 µm and 500 µm, enabling high accuracy and low force measurement of finely machine parts. Using the probe with the vision measuring function also enables precise positioning and targeted measurement of narrow and small sections. The E0,MPE is quoted at 1.9+4L/1000 for tactile scanning and E1x, E1y at 0.8+2L/1000 for image measurements. MPP-NANO scanning probe accuracy is quoted at 0.6 µm. The Miscan Vision System combines the functionality of a high-end vision measurement system with the versatility and flexibility of a 3D coordinate measuring machine. Optional accessories include a viewing unit, with which the scan measurement can be monitored on the PC monitor. Miscan Vision Systems are equipped with a CCD camera and various lighting options such as coaxial and LED ring light. Powerful and easy-to-use Mcosmos software includes the newly developed Visionpak-Pro software for vision measurement applications.